The Bower Scene Necklace is made from sterling silver sheet which has pieced by hand to create a lattice form. At the opposite side of the necklace is a beaded wire circle. 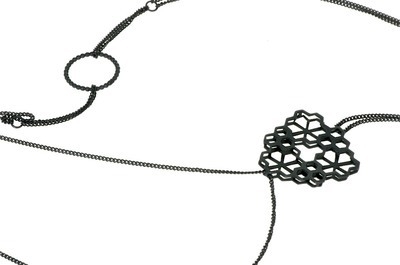 The necklace can be worn in multiple ways as the chain has been looped between the two parts of the lattice form therefore the chain can be worn at different lengths. The Bower Scene Necklace is made from sterling silver which has been oxidiesd.